Length: ~ 17 miles to Rapid #25. ~ 50 miles before the river exits the Gorge. Rec. Level: Those found in the season listed above. Gauges and sticks don’t exist at the moment. Permits: None, but a park entrance fee if $10 is required daily. This fee may increase. Take-out: Rapid #25 for a standard full day, but many take­outs are available above and below #25. 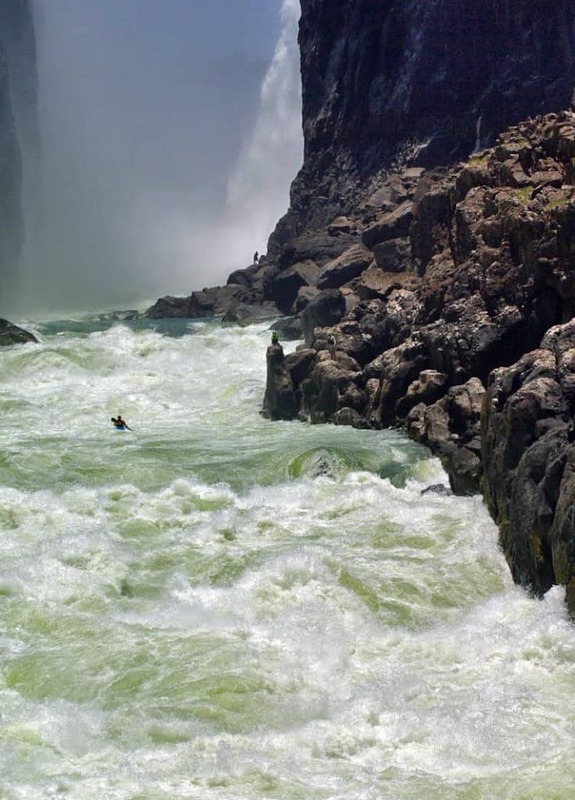 The Zambezi River below Victoria Falls boasts one of the most spectacular whitewater sections in the world. Meandering unassumingly in flat braids above the Falls, the Zambezi hosts a plethora of African wildlife, drawing high-­brow tourists from around the world to the surrounding national park, Mosi-­oa­-Tunya. As the river drops 100 meters over Victoria Falls, it enters the Batoka Gorge, and the beginning of the whitewater section. Thankfully, the "Smoke that Thunders" guards the Gorge from most of the wildlife above – only small crocodiles are seen sunbathing at water level, so you can focus on the whitewater. Emerging from the mist of Victoria Falls are rapids Minus 2 and Minus 1, two class V’s that some paddlers seek for extra credit. A short paddle up the flat pool above #1 arrives you at the Minus rapids, and provides a spectacular view, whether or not you want to test your skills on the whitewater. Beyond these rapids, and excepting #9, the rest of the Zambezi is a warm, friendly, big water playground. In fact, the most technically difficult move is the ferry out of the put-­in eddy, at #1. Downstream, #2 provides a great surf wave at many flows. Bungee jumpers scream and holler from the Zimbabwean­-Zambian Bridge (the Zambezi near Livingstone, Zambia, divides the countries of Zimbabwe and Zambia) above you as you enjoy long rides and an easy walk to catch it again. Catch-­on­-the-­fly waves, swirling eddy lines, big boils, and mile-­high waves trains pull you further downstream. The characteristic of Batoka Gorge makes for interesting logistics. The 1000 foot descent, and resulting ascent, along with dirt-­cheap labor prices, have created a porter culture fueled by neighboring villages. For a small fee, porters earn their living carrying kayaks, rafts, and overnight gear into and out of the Gorge. Both porters and drivers know the commonly used take­outs below #1, of which there are many. A full day ends at #25, about 17 miles downstream, but other take­outs include #7, #10, and #14, all on the Zambian side (a Zimbabwean vacation, based out of Victoria Falls, is equally doable; the author of this article, however, based his trip out of Livingstone, and became familiar with the logistics of the Zambian side). Furthermore, for a stay of any extended period of time, an overnight trip further down the Gorge is highly recommended. Not only do the rapids below #25 continue at high quality, if not lower frequency, big, runnable rapids and surf waves await downstream. Two rapids in particular, Lower Moemba and Dam Site, are impressive to behold, and commonly portaged. The latter, as the name implies, could one day be the location for an inundating, devastating dam. Learn more at The Bakota Dam on Facebook. Mile 0: Put-in below Victoria Falls in Mosi­-oa-­Tunya National Park. The first two rapids are known as Minus One and Minus Two and only run by the best kayakers. Rapid #8 - Midnight Diner (III or V) has a left side run known as Star Trek, center run known as Muncher Run, and right run known as Chicken Run. Rapid #9 - Commercial Suicide (V/VI) This is a river wide pourover with a narrow slot on the right. Commercial rafts portage this one. Rapid #11 - Overland Truck Eater (V) Put-in is just above here for high water commercial trips. Rapid #12 - Three Sisters (III/IV) There is a famous surf wave here. Rapid #15 - Washing Machine (IV/V) has a huge crashing hole in the center. Rapid #18 - Oblivion (V) The third wave here flips most rafts and marks the end of low water day trips. Rapids #19 to #25 (II/III) Easy runs at the end of the day. Rapid #23 is the last rapid on the "high water" one-day run. Mile 17: Take-out below Rapid #25 or continue downstream for a multi-day trip on the Zambezi. Mile 18.5: Closed Season and Open Season are technical rapids at lower flows. Mile 28: Chimamba (V) is a challenging drop, especially at higher flows. Below here are Upper and Lower Moemba, the latter of which is normally portaged. Mile 31: The Chinongo River enters and signals the location of a proposed hydroelectric dam. Just downstream Chibongo Falls (VI) is a mandatory portage on the right. Mile 78: Take-out at the Matetsi River confluence.